The purpose of this site is to aquaint you with our imprint and to tell you about the books we sell. In an excess of reticence, perhaps, we keep the commercial pitch behind the green tabs above. Using them you can learn about us, our products, and other matters. What you see in front of you is our blog—a free-wheeling discussion about books, reading, literature, language, and much else likely to interest our customers—people who read books. Please comment and participate. And we'd really love it if you would buy our books. It occured to us when considering the last post—which seemed pretty obvious, really—that books are sold by a lot of retail outlets, not just book stores, book clubs and online. Gas stations and truck stops sell books, audio books for the most part. Airport shops sell books. Office supply stores sell all sorts of computer manuals and business books. Then there are all those topic specific and how-to books sold at places such as health spas, building materials stores, and craft stores. So, before moving on to a closer look at book stores specifically, we wanted to finish the picture on where we buy books. We dug around in the rich data made available by the Census Bureau and came up with the following detailed breakdown of book sales by retail outlet. Once again, this graphic reaffirms what we’ve already seen in recent posts. Book stores have lost ground in terms of the percentage of all books sold that they sell. Electronic outlets—read online sales— have gained ground but not only against book stores but also as compared to all outlets selling books, all that is other than used merchandise stores. 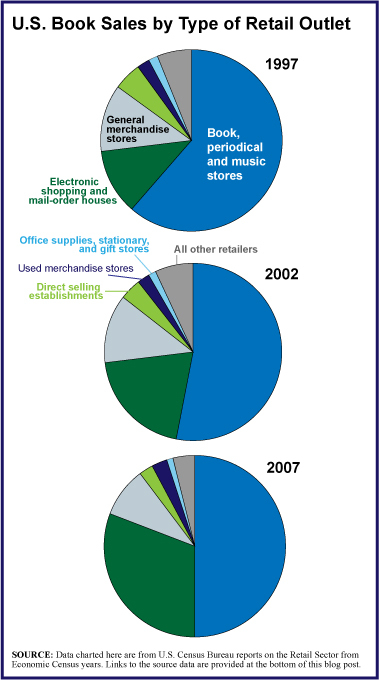 “Electronic shopping and mail-order houses” and “used merchandise stores” are the only two categories that saw growth in their share of the total book selling market between 1997 and 2007. Granted, “used merchandise stores” only saw their book sales grow from 2.2% of the market to 2.6%, this was the only category other than electronic shoppping and mail-order houses that grew at all. And the e-commerce and mail-order category, well, it grew from 11.5% of the book selling market to 30.9% in 2007, and has only grown since then. For the even more detailed figures, here is the table we keyed in order to produce the chart above. 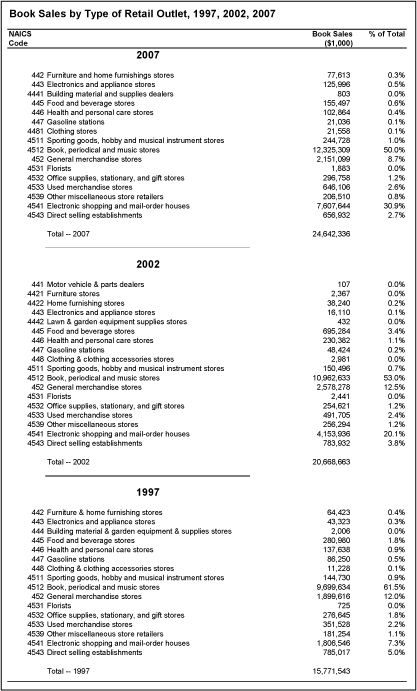 Data for 2007: “2007 Economic Census — Sector 44: EC074413: Retail Trade: Industry Series: Preliminary Product Lines Statistics by Kind of Business for the United States: 2007” available online here. Data for 2002: “2002 Economic Census — Sector 44: Retail Trade: Industry Series: Product Lines by Kind of Business for the United States: 2002” available online here. Data for 1997: “1997 Economic Census — Sector 44: Retail Trade: Merchanide Line Sales: Merchandise Lines by Kind of Business: 1997” available online here. Reading in Color, Why is this such a big deal?